Very little is known about Jan Pauwel Gillemans (1618-1675) the Elder's life and work. Son of a goldsmith, he was born and resided all his life in Antwerp. He was most likely in contact with Jan Davidsz. de Heem's circle. His son, Jan Pauwel Gillemans the Younger (1651-1704) was also a still-life painter. 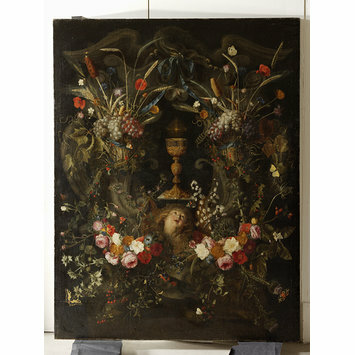 This painting is a good example of the Flemish flowers pieces in which was inserted a biblical subject matter. Most of the flowers and fruits here depicted allude to the Passion of Christ and echo the Holy Sacrament depicted in the centre of the composition. These compositions are characteristic of the school of Antwerp where Jan Brueghel the Elder (1601-1678), Daniel Seghers (1590-1661) and their followers produced still life combined with a figural scene. A garland of flowers surrounding a cartouche containing an angel's head and the holy sacrament; the whole composition is surmounted by an eagle. 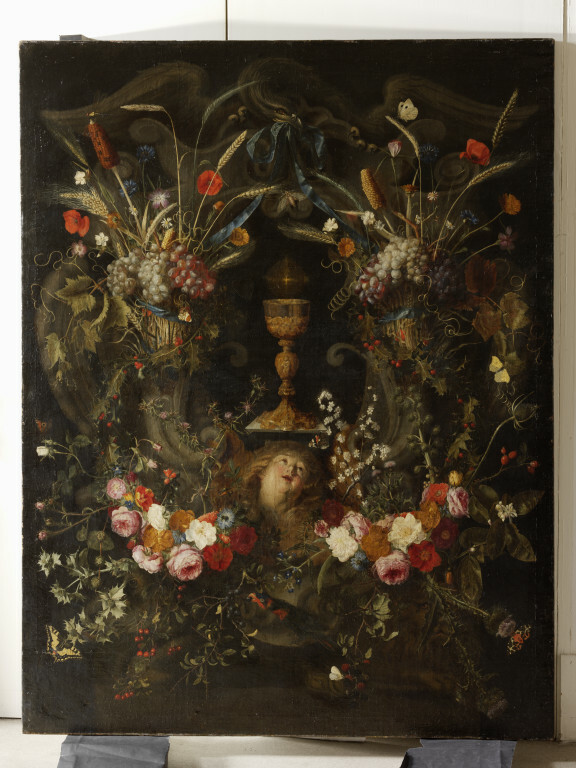 Historical significance: Formerly attributed to Daniel Seghers (1590-1661), Fred Meijer reattributed this work to the Antwerp painter Jan Pauwel Gillemans the Elder (verbal opinion, February 2010) who was famous for such floral compositions. This work was acquired with another flower-piece of similar character, signed by Jan Pauwel Gillemans (V&A, 4419-1857), in which a garland of flowers surrounds a landscape within a cartouche. Together they may have been intended as a pair. The present painting is a symbolic still-life in which flowers bear a hidden symbolic meaning. The lower part of this garland is dominated by spiky plants, especially roses and thistles, hawthorn, blackthorn, rose-hips and raspberries. Above are grapes, stalks of wheat and corn, poppies, cornflowers and narcissus. Most allude symbolically to Christ's Passion and the Holy Sacrament, represented as a chalice with a nimbus. The eagle crowning the wreath - a motif of ancient Roman derivation - symbolizes the Resurrection, as do the butterflies while the parrot appears to be a decorative accessory. The garland of flowers alludes therefore to the Passion of Christ and enhances the biblical importance of the chalice in the centre of the composition. Jan Pauwel Gillemans the Elder (1618-1675) was the son of a goldsmith. He was born and lived in Antwerp, but little is known of his work. He was probably in contact with Jan Davidsz. de Heem's circle. His son, Jan Pauwel Gillemans the Younger (1651-1704) was also a still-life painter. At Antwerp flower painters such as Jan Brueghel the Elder (1601-1678) and Daniel Seghers (1590-1661) often collaborated with figure painters including Peter Paul Rubens (1577-1640) on works such as the Madonna in a Floral Wreath, ca. 1620, Alte Pinakothek, Munich. Paintings with cartouches representing religious subjects such as the Virgin and Child could serve for private devotion. Later, similar compositions were combined with secular subjects, including portraits. Still-life painting reached the height of its popularity in the Netherlands during the 17th century.The style set by Snyders's Rubensian banquet pieces was developed at Antwerp by the Dutchman Jan Davidsz. de Heem (1606-1684), and opulent baroque confections of fruit, flowers, and precious vessels became popular throughout Europe. Scholarly opinion is divided over the extent to which these works were envisaged asmemento mori, or vanitas subjects, reminding of human mortality and inviting meditation on the passage of time. Fruit and flower pieces retained their popularity until the 19th century. Kauffmann, C.M. Catalogue of Foreign Paintings, I. Before 1800. London: Victoria and Albert Museum, 1973, pp. 261-262, cat. no. 324. Hairs, Marie-Louise, Les Peintres flamands de fleurs au XVIIe siècle Tournai, 1998, pp.108-71. Walter Couvreur, ‘Daniël Seghers’ Inventaris van door hem Geschilderde Bloemstukken’, Gentse Bijdragen tot de Kunstgeschiedenis en de Oudheidkunde, vol. 20, 1967, pp. 87-158. Wilfred Seipel ed., Das Flämische Stilleben 1550-1680, exh. cat. Kunsthistorisches Museum Wien 18 Mar - 21 Jul 2002 - Kulturstiftung Ruhr Essen, Villa Hügel 1 Sep-8 Dec 2002, p. 338.